Our highest intensity 12 volt LED stop and tail light which is perfect for the Lucas 529 rear lamp fitted to many classic motorcycles and cars of the 1950s and 60s. Featuring a total of 36 warm white LEDs enclosed in a glass globe, this LED lamp is almost indistinguishable from a conventional filament bulb except that it consumes only a fraction of the power. The next best thing to our custom designed LED light boards! Brand new product for 2014! This is the brightest and best of our LED stop and tail light ‘bulbs’ and is the perfect lighting upgrade for the Lucas 529 style of rear lamp fitted to many classic cars and motorcycles from the 1950s and 60s. This is simplest the brightest 12v LED light available for the Lucas 529 rear light. 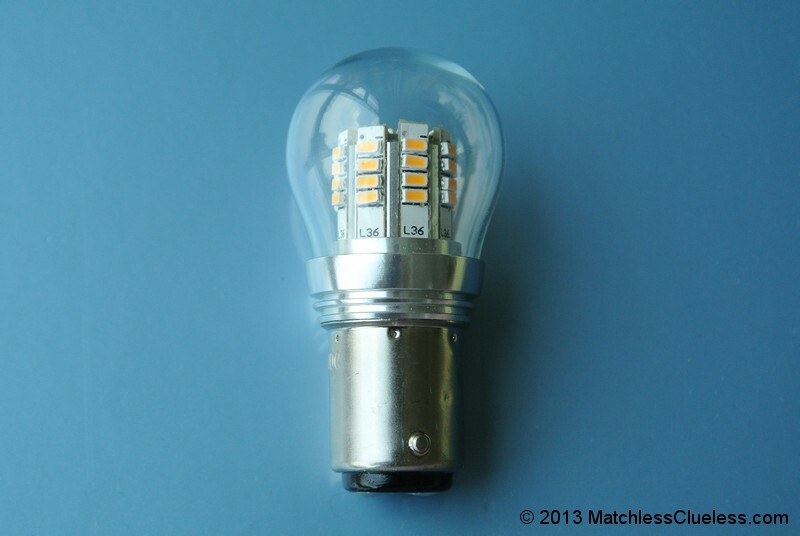 The LED light features a total of 36 warm white LEDs that are distributed to provide 360 degree light output which is very similar to that of a conventional filament bulb. 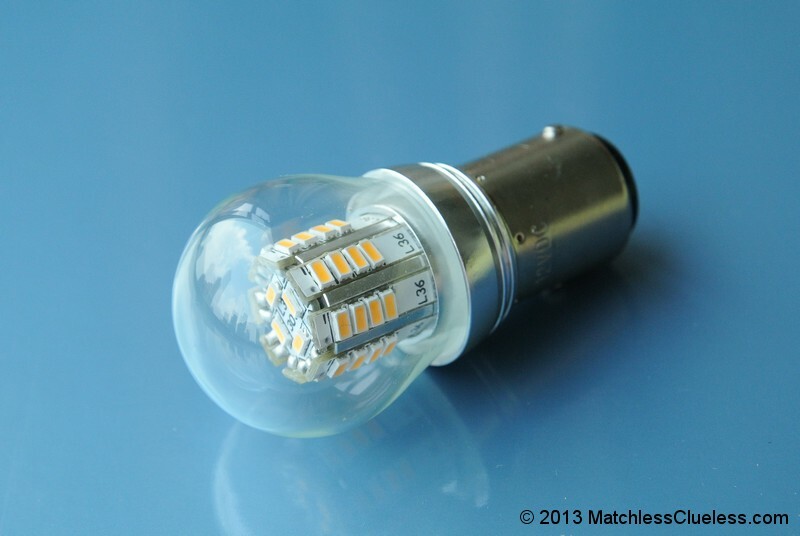 With its glass globe and warm white light output, it is difficult to tell the difference between this LED light and a standard filament stop and tail lamp. The only real difference is that the LED unit consumes only a tiny fraction of the power. This LED tail light is suitable for use with all 12 volt vehicles (and also with 24 volt vehicles too) which are wired with a negative earth arrangement. Please note that it is NOT compatible with positive earth motorcycles. It uses the standard BAY15D dual-contact offset pin base which is sometimes known as the 1157 fitment. It has dual intensity output which means that all of the 36 LEDs illuminate for the tail light function, and they all light up even more brightly when the brakes are applied. If your Lucas 529amp is used only as a tail light (i.e. with the brake light function) you can still use this bulb and choose either the dim or bright setting to be your tail light. The warm white colour and wide 360 degree illumination pattern means that this LED is ideal for both lighting up the rear light and providing the necessary number plate illumination. This is simply the best 12 volt LED rear lamp bulb that is available! The Lucas 529 tail lamp (also sometimes known as the L529) was fitted to many lightweight classic British bikes between the mid-1950s and early 1960s. Motorcycles which use this lamp include the AJS 350 and 500, Ariel 350, BSA Bantam, Enfield 250, Francis Barnett, James, early Triumph T20 Tiger Cub and Terrier, Velocette and Vincent Black Prince and Knight models, amongst others. It was initially used in single filament (tail light only) form with bikes with direct lighting systems, but was later also used with a twin filament bulb to give both stop and tail light functions. The above current and power consumption figures are taken from actual measurements at a supply voltage of 12.8 volts (corresponding to a fully-charged 12 volt battery). Why buy this LED light? If you’re looking for a 12 volt LED light upgrade for your classic Lucas 529 motorcycle or car rear lamp then this 36 LED lamp is simply the best available! None of the other LED units we have tested come anywhere close to matching its light output and distribution when installed in a L529 rear light. In terms of power consumption, this LED light consumes only 0.55 watts when the tail light is on and 2.79 watts when the brakes are applied. Compare this with the 5 and 21 watt power draw from a standard 21/5W filament bulb and you’ll see that it consumes only a tiny fraction of the power. This makes it ideal for installing on classic vehicles where the charging system (particularly those with the earlier dynamos) needs a helping hand to keep the battery fully-charged. It is also a great way to free up some power to upgrade the headlamp to a higher wattage model for better illumination of the road ahead. 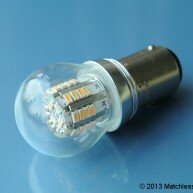 This LED unit is almost indistinguishable from a conventional filament bulb in terms of looks. The 36 LEDs emit a warm white colour which matches that from a standard bulb giving excellent illumination of both the rear light and the number plate below (note that many LEDs emit a cool white light which looks a little too blue and modern for a classic vehicle). 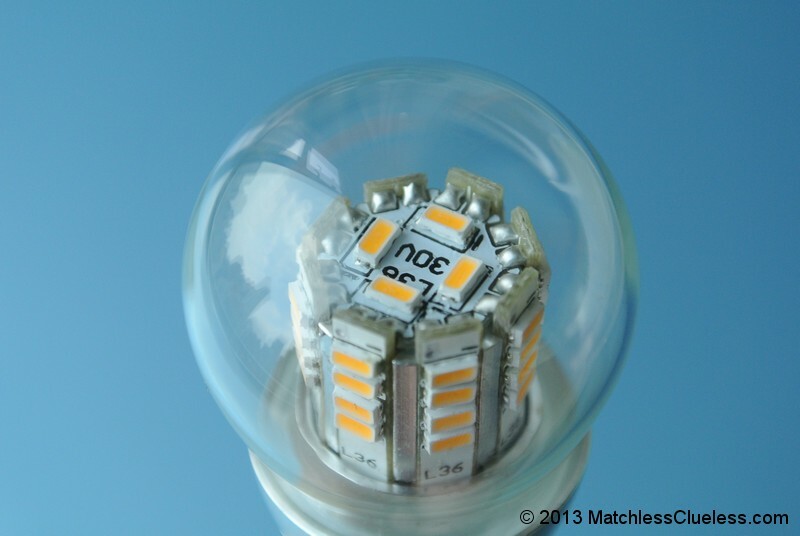 The 36 LEDs are arranged to give even light output in all directions, again just like a conventional light bulb. Actually we think it lights up a Lucas 529 rear lamp even better than a conventional bulb! For 6 volt motorcycles, our 6v LED stop and tail light provides excellent illumination of the rear lamp in both tail and stop light functions. We recommend the red version for maximum tail and brake light brightness, although admittedly illumination of the number plate is a little limited. 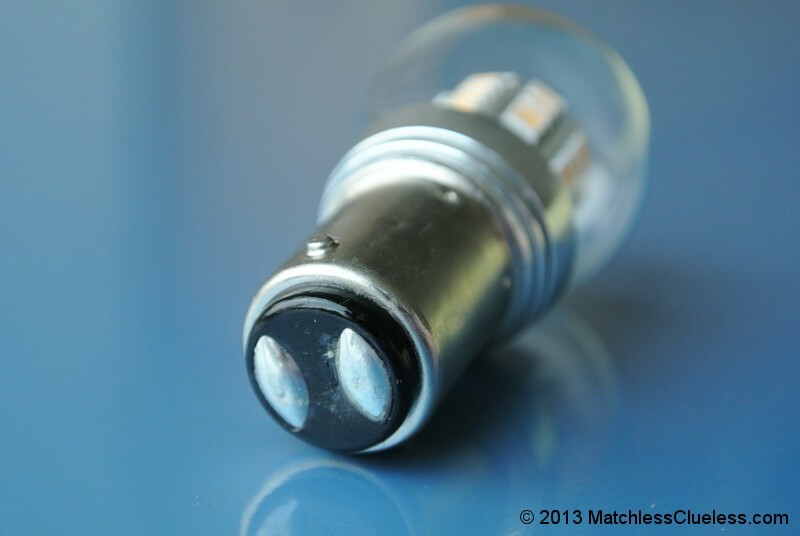 Here at MatchlessClueless we have tried and tested countless LED lighting options and have found very few that live up to our high standards of quality and brightness. 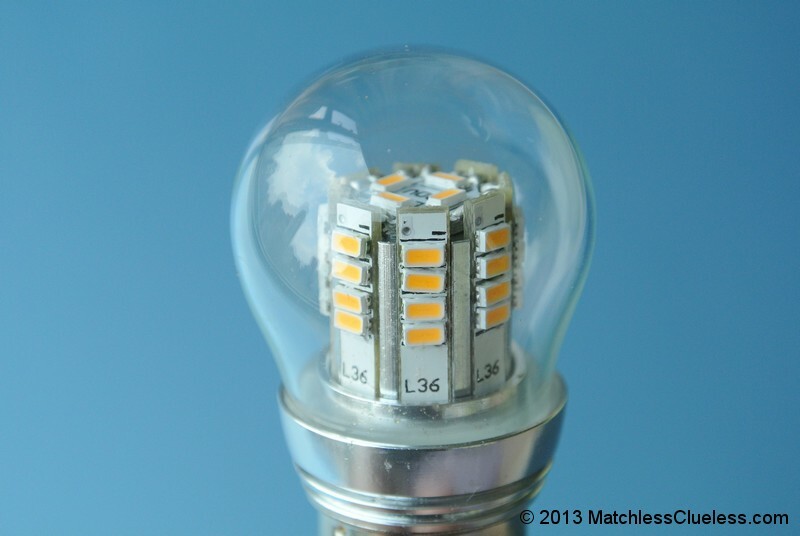 The majority of LED units on the market aren’t that good and give disappointing performance. That’s exactly the reason we started produced our own LED lighting boards in the first place! 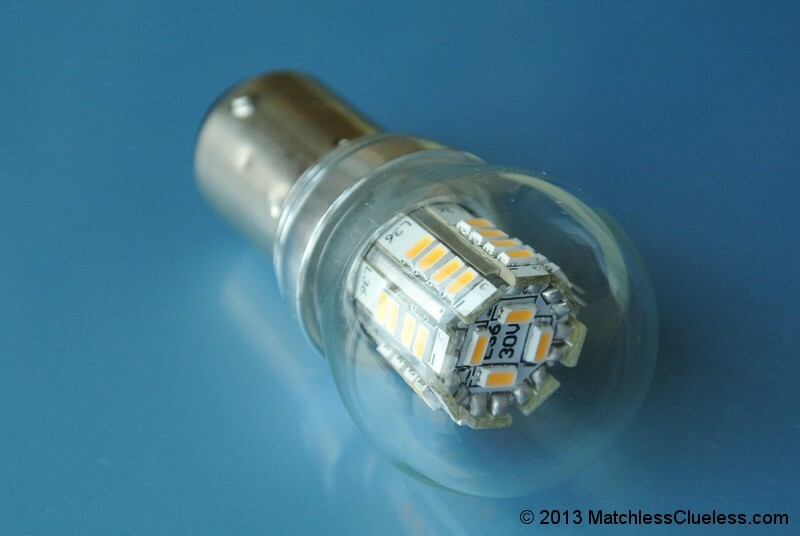 However we have recently been able to source a few good quality LEDs which we think are good enough to offer on the MatchlessClueless website. These are not quite as good as the LED lighting boards we design and make ourselves, but they are the next best thing. 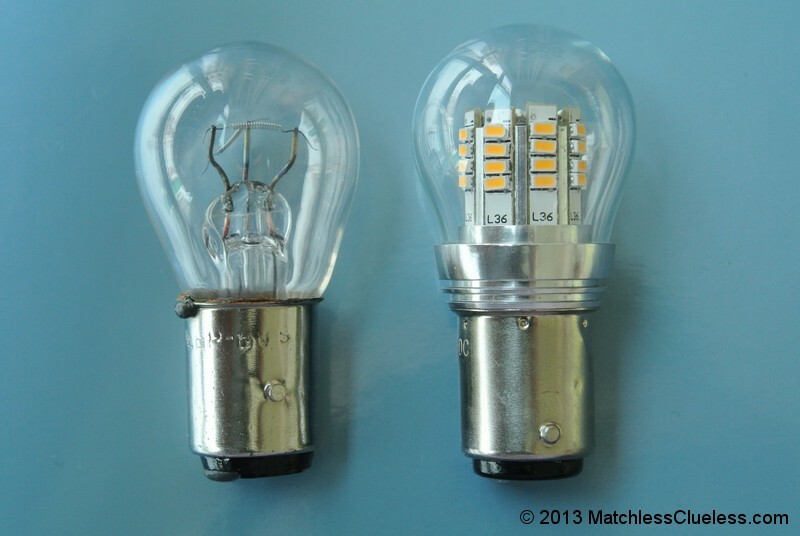 All LEDs are not created equal, even is they look similar to the ones you see here. This is why we are confident in recommending and selling only the best LED lighting options for your motorcycle.